Hollister City Hall is located at 375 Fifth Street, Hollister, CA 95023; phone: 831-636-4310. 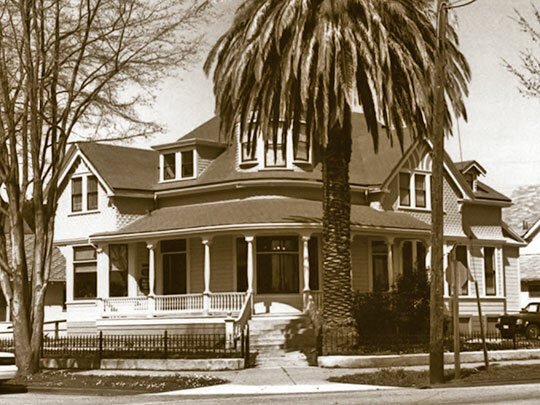 Photo: Former Residence on Monterey Street (Porter House, converted to an office building), ca. 1890, Monterey Street Historic District, Hollister, CA. The Historic District was listed on the National Register of Historic Places in 1992. Photograph by Donald S. Napoli, 1992, for nomination document, Monteret Street Historic District, NR# 92001740, National Park Service, National Register of Historic Places. Residential building reflected the development of Hollister from its founding in 1868 until the start of World War II. The town's early growth, social structure, and aesthetic sensibilities can be seen in the number, type, size, and location of its residences. Residential construction in Hollister actually began before the founding of the town in 1868. The area earlier served as headquarters for the sheep ranch owned by W. W, Hollister, who arrived in the San Juan Valley in 1855. Hollister's ranch house, constructed in 1862, was the fist dwelling constructed on what became the town site. Hollister sold his holdings to the San Justo Homestead Association in 1868. The owners of the association knew that the Southern Pacific Railroad planned to extend its line from San Francisco and Gilroy farther south into the San Juan Valley. They confidently subdivided the ranch lands and laid out the new town. The arrival of the railroad in 1870 insured the success of the venture. Local boosters hoped that the line would continue south, cross the coast range, and link Hollister to the Central Valley. That plan never went into effect, and Hollister remained on a long spur. Nevertheless, the town quickly became the center of a productive agricultural region. Grain was the main crop. By 1876 Hollister boasted of the world's largest hay warehouses and began calling itself the "Hay City." With the agricultural boom came other changes. Population grew rapidly in Hollister and throughout the San Juan Valley. Hollister had perhaps 1,000 inhabitants in 1873, making it twice as large as the nearby mission town of San Juan Bautista and over half the size of established farm communities in neighboring counties such as Gilroy, Salinas, and Watsonville. With growing numbers came increasing political power. Local politicians engineered the detachment from San Benito from Santa Cruz County in 1874. Hollister was incorporated in the same year and became the county seat. The town assumed a variety of social and economic functions. The downtown commercial area, centering on Fourth and San Benito Streets, offered an array of retail shops, over a dozen hotels and boarding houses, and an assortment of service establishments. Also downtown were the headquarters of Hollister's civic and fraternal groups. Directly to the east near the railroad tracks were the grain warehouses, a flour mill and lumber yard, and the Southern Pacific freight depot. The largest residential district grew up to the west along Monterey Street and cross streets from Fourth to South Streets. The town's churches and schools were established in the district. A smaller residential area developed north of the industrial section on the eastern side of the railroad tracks. The social organization of Hollister was typical of small farm communities. The town was too small for fine gradations of class. Distinctions arose nevertheless, with successful entrepreneurs and land developers at one end of the spectrum and unskilled laborers at the other. In between were managers, professionals, operators of small businesses, white-collar employees, and skilled craftsmen. Adding to the mix were those who lived and worked on local ranches and came to town for a variety of personal and business reasons. Although the family was the major unit of social organization, as many as a fifth of the population was single. The typical adult resident was born in the eastern United States and had an Anglo- Saxon heritage. But many members of other ethnic groups lived in town, and a few ranchers of Hispanic origin retained land grants from California's Mexican period. Hollister assumed a character by 1880 that was not essentially altered during the next 60 years. The town did change, however. Hollister's size continued to increase, with growth averaging 16.5 percent for each decade between 1880 and 1940. The biggest boom came in the early years of this century, with the population roughly doubling between the end of the national economic depression of the 1890s and the start of the recession that preceded American entry into World War I. The town took on a different look. The downtown commercial district responded to population growth by intensifying the use of many parcels and expanding, primarily to the south. The coming of the automobile led to the most dramatic changes in usage, with feed lots and livery stables giving way to gas stations and auto showrooms. The city government expanded operations during the decade before the First World War, constructing a new city hall, paving the streets, taking control of the local hospital, and erecting a new library. The industrial district, meanwhile, reflected changes in local agriculture. In the post-war period the cultivation of fruits and vegetables came to supplement grain production. As a result, the town obtained several canneries, which dramatically increased the number of industrial jobs. Hollister's residential area spread to the west and south, with significant construction, primarily of small houses, undertaken directly south of the industrial section in the 1920s. Economic expansion slowed during the Great Depression and then came pretty much to a halt as Hollister joined the rest of America in the Second World War. † Donald S. Napoli, Residential Building in Hollister, 1868-1941, nomination document, 1992, National Park Service, National Register of Historic Places, Washington, D.C.